This entry was posted in Transition Posts and tagged Disability, Marine Corps, military, Retirement, Retiring, TAP, Terminal Leave, transition, VA, Veterans Administration. Bookmark the permalink. That phrase “terminal leave” always causes me to pause, and consider what this means. Of course in this case, a positive outcome is likely. You obviously enjoy the written word. Life is too short to spend your days in endeavors that aren’t rewarding in all respects. 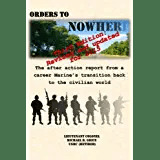 Forty years of good fortune in life, love, and work, and your “Orders to Nowhere” stories, lead me to think that you have found the right niche. I believe that, like me, in another forty years you will look back and think how fortunate you are to have been paid to have fun. Thanks Vance. You couldn’t be more right. I am actually at MCRD San Diego right now, and 1st Battalion is conducting a Recruit Motivational Run right outside the building I am in. It really takes me back to where it all started. I really do like to write, and I appreciate the support!